Join us on a magical kayak tour that you’re sure to remember! 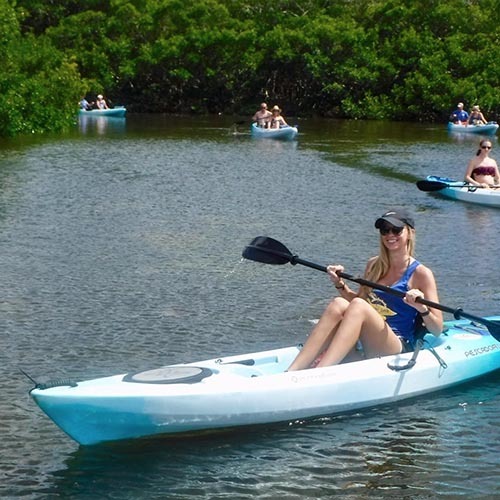 Our expert guides will take you on a two hour tour that leads you out into Sarasota Bay in search of dolphins and manatees, through Sarasota’s exotic mangrove tunnels, and if time permits a stop off at a secluded beach where you can take a quick dip in the bay or do a little shell hunting. 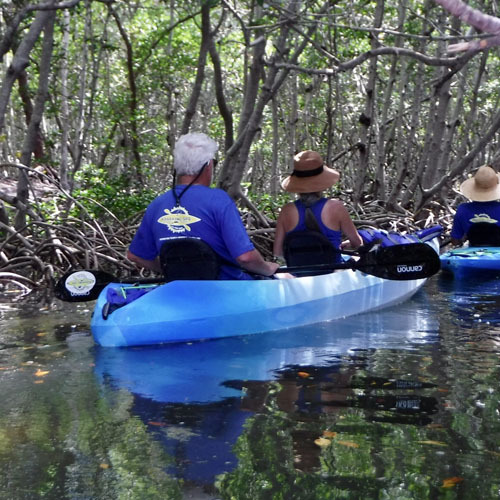 The mangroves off of Lido Key are one of the most popular kayaking spots in Sarasota for both locals and visitors. It’s no wonder why, either. 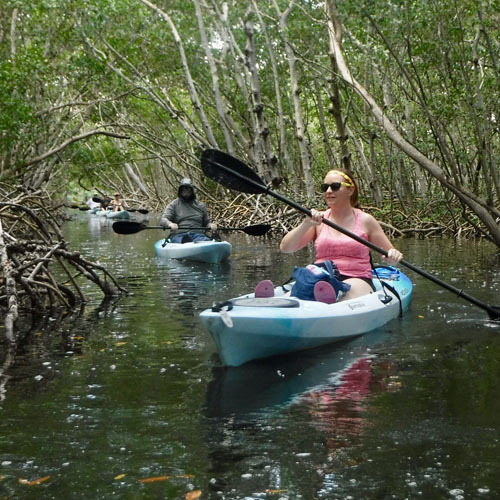 Paddling your kayak through the mangrove tunnels will make you feel like you’re in a scene from a movie – it truly is a whole new world. All your troubles will melt away as you enter the tunnels. . 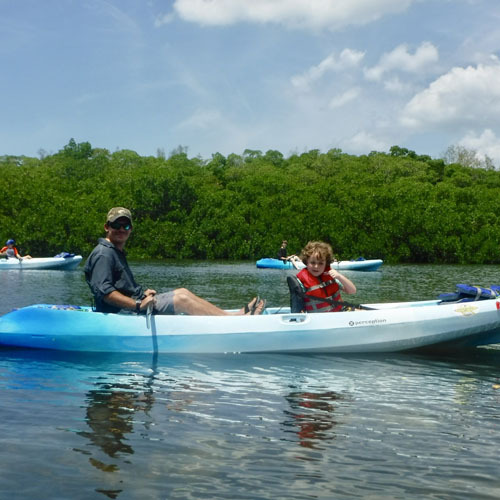 While beautiful, the mangroves aren’t the only reason paddlers flock to Sarasota Bay. Many come to see the wide array of marine life. 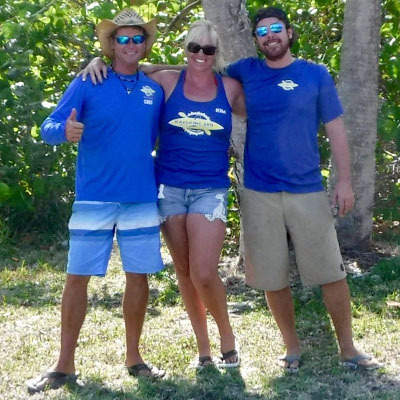 Dolphin and manatee sightings (while never promised as it is nature) are plentiful along with other favorites such as star fish, jelly fish, crabs, and so much more. Throughout the kayak tour our guides will be on the lookout for wildlife to point out so you can get your camera ready for the perfect shot! A wide array of birds also call the mangroves and Sarasota Bay home. Awaken your inner birdwatcher and get ready to see osprey, pelicans, great blue heron, cormorant, and great white egret to name a few. The cormorant are known to swim along-side kayaks, so be prepared to make a friend or two as well! At the end of your experience be prepared to feel a sense of well-being and connectivity to nature. Come see why our guests come back to us year after year!